A new vulnerability (CVE-2012-0056) that affects almost 650 different builds of the Linux kernel builds allows effortless privilege escalation to root. It works by forking child processes to trick the self_exec_id check on /proc/pid/mem access, allowing the code to modify its own SUID and gain root. My own research shows that it also affects certain 3.0.0 kernels, so I’m not sure why that’s been omitted from listings. I’ll take more of a detailed look into the scope of the problem today, and update this post with the results. The security researcher zx2c4 has released a technical description of the bug, as well as an exploit. [+] Ptracing su to find next instruction without reading binary. [+] Waiting for ptraced child to give output on syscalls. [+] Error message written. Single stepping to find address. [+] Resolved call address to 0x8049570. [+] Opening parent mem /proc/4594/mem in child. [+] Sending fd 6 to parent. [+] Received fd at 6. [+] Assigning fd 6 to stderr. [+] Seeking to offset 0x8049564. I was dubious at first, but I really have grown to like Redis. It’s a wonderfully simple solution to the problem of high-performance fast-changing data storage. However, its simplicity (combined with the incompetency of certain users) can easily become a detriment to security. The Redis protocol is a simple plain-text mechanism, offering no transport layer security. This is a problem in itself, but it gets worse. By default, it listens on all available IP addresses on port 6379, with no authentication required at all. So, as you might imagine, quite a few of these servers end up facing the internet. So, I decided to see if I could find any. I wrote up a quick script to scan random /24 ranges for Redis installations, and was amazed at the result. From a single day’s scanning, I found 48 open servers. What’s worse, two of them are major household-name websites – both of which were using Redis to store their page content. Obviously both of these companies have been contacted. It gets even worse, though. Redis allows you to send a DEBUG SEGFAULT command, which purposefully crashes the server. This means you can take down any Redis installation remotely. Nasty stuff. So, the bottom line is to keep your Redis server secure! Add a passphrase to your configuration. Use a firewall to block all connections to port 6379, except from trusted IPs. If you must operate in an untrusted zone, enforce IP-layer security (e.g. ipsec). Keep to the above, and you should be ok! Update: The creator of Redis, antirez, responded to this post, informing me that you can in fact make Redis bind to a single IP in redis.conf. I’d like to clarify my point on the security of Redis – it is designed to be lightweight and provide only minimal security, so this problem is not a flaw of Redis itself. Instead, it’s a flaw of how people are using (or abusing) Redis. The current ethos is that you should always apply network security to your NoSQL systems – if you don’t, it’ll end in tears. ACTA – European SOPA tries to violate worldwide rights. It would be silly of me to tell you what Anti-Counterfeiting Trade Agreement (ACTA) is about, because you can’t miss it right now. The internet is abuzz with protest about SOPA, PIPA and ACTA right now, with good reason. SOPA and PIPA were recently defeated after mass outcry from people all across the world, and it’s time to do the same for ACTA. The ACTA bill was drafted and negotiated in secret, violating the principles of a transparent leadership. It gives governments the right to perform invasive searches of your person or property without probable cause or warrant. It forces ISPs to maintain logs of your assigned IP addresses and perform deep packet inspection on your traffic. It breaches numerous communications privacy rights. It is written in vague legal terms, allowing for twisting the rules to fit individual agendas. So, if you feel the same as I do, and want to help prevent ACTA from becoming law, click the image below to act against ACTA. 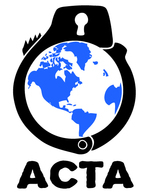 Update: Please sign this petition too: Just say no to ACTA. Posted on January 25, 2012 January 25, 2012 Categories Internet Rights, RantsTags acta, freedom, pipa, rights, sopaLeave a comment on ACTA – European SOPA tries to violate worldwide rights.